Do you need us to import your data? We have some purchase options for you, which you can take advantage of any time. 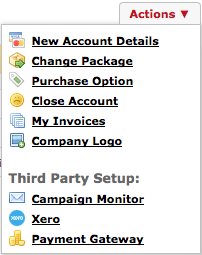 Go to the Actions menu in your Account page—choose Purchase Option. On the right side panel pick what you would like. Single File Import: Do you have a list of products you would like us to import into your Simple Inked account for you? Even a service list? Perhaps you have a file with just client details? Provided that your data is in an Excel Spreadsheet format, or a CSV File; we can import it for you. 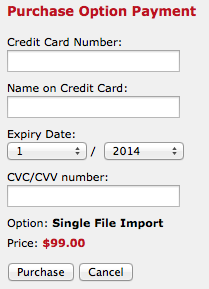 The Single File Import is $99 per file. Full Data Import: This cost is a once off $399 which covers all clients, operators (staff), products and services and service history (provided this is retrievable from previous system database or the data you provide in a spread sheet format). Unfortunately future appointments cannot be imported from your previous system. We also can't import any transaction/financial history. You can email us your data file, or if it is too large, we can email you a link to a dropbox folder in which you can upload it too. Note: Once we have your data we give ourselves up to one week to complete the import process. Online Training: We give you a call at an arrange time to teach you Simple Inked's functionality over the phone. The training session content is the same as the Knowledge Base content. Online Training is $199 per session. Start Up Kit: Full Data Import + Online Training Session. Once you have made your selection, click Next. Fill out your credit card details, and Purchase. We will be notified of your purchase and will contact you shortly.